Place the yams on a baking sheet and pierce in several places with a fork. Bake until very tender when pierced with a fork, about 1 hour. Butter a 2-3 quart baking dish. Halve the yams and, using a spoon, scrape the flesh from the skins into a large bowl. Add 3/4th cup (or half, if you halving the sugar) of the brown sugar and the cream or half-and-half, butter, cinnamon, nutmeg, allspice and vanilla. Using an electric mixer on medium speed (or potato masher or wooden spoon), beat until smooth, about 2 minutes. 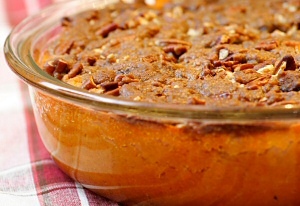 Spoon into the prepared baking dish, smoothing on the top. Sprinkle the pecans and the remaining sugar evenly over the top. Serve hot directly from the dish.